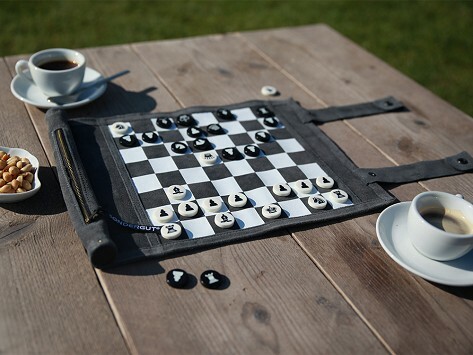 Play chess or checkers anywhere—indoors or out—on a beautifully designed travel board. Suede playing surface, with a leather exterior, for a high-quality look and feel. Rolls up and snaps for travel and weighs less than half a pound. 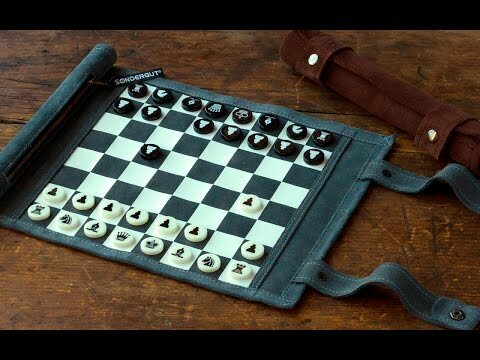 Zippered pocket holds the game pieces, which are checkers on one side and marked as chess pieces on the other. Dimensions: Rolled: 10" x 2" x 2"; Flat: 14" x 10" x 0.75"
Take it with you, you’ll be happy you did. Nice travel game set! Made of high quality leather! Chess and checkers. No magnets to keep pieces in place, but still very nice set. There’s nothing quite like playing classic games—like checkers, chess, or backgammon—on a high-quality board. When you want to play on the go, Sondergut makes beautiful, lightweight travel boards that you can roll up and take anywhere. These travel chess/checkers and backgammon boards are just over a foot long and weigh less than half a pound. Play on a plane, a road trip, a picnic, camping, or even on one of those tiny tables at the park or a coffee shop. The board’s playing surface is sophisticated and suede-backed with a soft leather that’s pleasing to the touch. A zipper storage pocket is built right in on the edge. This safely stores the stones, dice, and doubling cube for you backgammon players or the iconic tokens for the chess set. Speaking of which, flip the pieces over, and you’re ready for checkers. Both when in play and when packed away, Sondergut’s boards look and feel deluxe, worthy of the classic games for which they’re made.